Based on a research done by University at Buffalo (UB), children are more physically active when they are presented with a more selection of toys they would have. Children usually choose a few toys to play with and this limits their active play. When they are given more than four (4) choices, they are more likely to play more toys, keeping them physically active, and social when there are other children around. The study also showed that girls can be active as boys, provided they are given toys that will allow them to do more action. These are called “active toys” – toys that allow them to run around, move up and down, or anything that avoids them to be stationary. When the girls in the study were given choices of active toys, their activity increased by 200% compared to 42% of the boys. This shows that the toys we provide our kids matter. When we allow our children to choose all the toys they would have, like tablets, playbook or dolls, without our assistance, we limit their capacity to move. Moreover, giving the kids different kinds of toys widens their toy selections and this would also allow them to learn from each. Give your children the chance to be more active as they play outside by buying them the Original Copter. The Original Copter is designed to be played in wide open spaces. 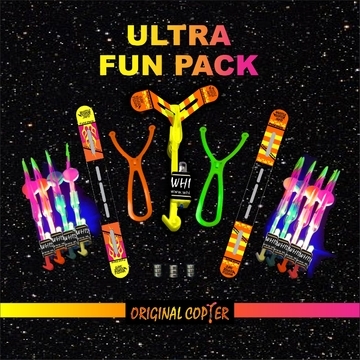 The Original Copter is a modified sling shot toy that flies the bullet with wings up the sky and fall like a rotating helicopter’s blade. The attached LED bulb makes the toy really fun, as it like a firework during the flight. This toy gives the enjoyment and amazement while your kids run around. It also helps your kid master his hand control coordination and arithmetic and thinking skills. The Original Copter is best played during the night, as the LED light imitates that of a firework. Best of all, the whole family can enjoy and play together. You can choose from our Whistle copter, Clown Fish Bubble Gun and Sword.